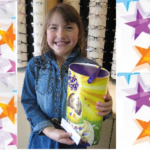 Well done to our Easter Egg winner, Iona Anstice. Iona joined in with lots of Frodsham children to correctly answer our competition to see how many Easter eggs were in our shop window. We had lots of entries with varying answers. The correct amount of eggs was 20, so well done all of you who had a go and got the correct answer. Next time you’re in Frodsham Look out for our next competition window, which will be coming soon. A visit to Taylor’s, your local Cheshire opticians will also give you the opportunity to see our new ranges of spectacle frames and sunglasses. So why not book a comprehensive eye examination, so that we may check the health of your eyes, and help you to see the best you can.